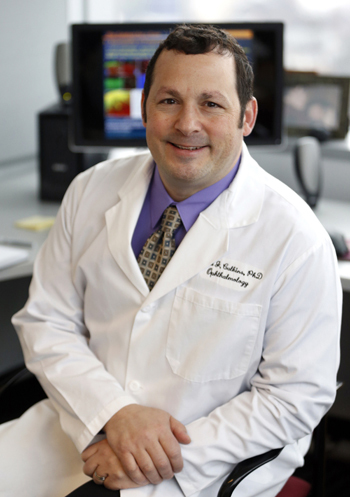 Three years ago, a team of researchers led by David Calkins, Ph.D., vice chair and director of Research at the Vanderbilt Eye Institute, showed that the first sign of injury in glaucoma, the leading cause of blindness in the United States, occurs in the brain. In 2010, his team showed that glaucoma was similar to other age-related, central nervous system diseases like Alzheimer’s and Parkinson’s. That information allowed them to take a neurobiological approach in the development of potential treatment options that focused on neuronal activity in the middle brain, where the optic nerve forms its first connections. Armed with the findings that the axons in the optic nerve lose their ability to communicate with their projection site in the mid-brain, the team proposed that if they could stop the loss of communication between the retina and the brain, then the ensuing degeneration ceases. “The standard of care for glaucoma treatment is a daily topical eye drop to control ocular pressure,” said Calkins. “But some 30 to 40 percent of patients continue to lose vision despite the treatment. We wanted to test whether a neuroprotective eye drop could stop neurodegeneration regardless of elevated ocular pressure. Calkins’ team partnered with Alcon and the Glaucoma Research Foundation to test an eye drop formulation of a potent stress-activated component called p38 map kinase inhibitor. The results, recently published in Neurobiology of Disease, showed that over a period of several weeks of elevated ocular pressure, the drops completely stopped the loss of communication between the retina and the brain as well as the ensuing degeneration of the retina and optic nerve. Calkins explains that as glaucoma, the world’s most prevalent age-related neurodegenerative disease, progresses the retina stops talking to the brain and soon afterward the axons begin to degenerate, then the retina and finally the brain. Safety and efficacy testing is currently underway in hopes of beginning a clinical trial of the drug in the next few years.